JM Instruments is based in Hilton, Derbyshire (DE65 5AE) Tel: 01283734388. Making affordable yet highly crafted customisable lutes and ERG guitars to order and stocked. All based on original instruments in museums. 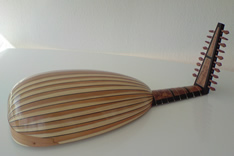 Specialist instruments include the electric mandora (lute-guitar). Student instruments give you an alternative to the 'factory' amalgamated models with their rope-borderless flat un chamfered/carved machine-cut roses, mostly not based on a specific original either. Hiring a lute is an option too at just £35 per month. Popular examples are: the student folding theorbo, based on Sellas (Paris E.547), with it's invisible folding mechanism (2013) for Richard Mackenzie hear his latest recordings on Spotify. Then a 10/11 crs Hans Frei lute (Vienna KHM C34) for Alex McCartney, hear here. Lastly a 10crs Burkholtzer (KHM NE48) with yew multi ribs heard here. See the lutes to hire here and the gallery of the original lutes in museums. The worlds first electric baroque lute was created in 2010 for Dale Harris playing Vivaldi's largo and recently Bach on the lute. Then the student Terz guitar, was made for pro guitarist Jamie Akers, heard here: track 5&6. Then came the Eco-friendly 7000 year old bog oak lute, played here by the K'antu Ensemble. In 2014 the student Mandora/Gallichon was created, here first. Next was the 7crs Student lute-guitar here with it's light lute construction but tuned as a guitar tuning in e (a=440Hz), and a familiar 65cm. 2015 saw the creation of the student Quito Marianita for Richard MacKenzie. 2016 saw the Student 16&17crs Angelique/13crs Baroque lute for playing both repertoires on the same instrument! 2019 brings the student 6 course Spanish Classical/Early Romantic guitar as heard here. Sorry but the 6crs 'Childrens Lute' is currently out of stock. The case is not included in the prices quoted on here.